Want to host a Business After Hours in 2019? The Boone Area Chamber of Commerce is accepting applications for its 2019 Business After Hours event series. Held on the second Thursday of each month, Business After Hours brings Chamber members to your location, providing an excellent way to present your business to the High Country Community. Each event lasts from 5-7 p.m. and attendance ranges between 75-150 attendees. If selected, businesses are required to pay a $150-dollar non-refundable deposit at the time of contract to secure the date. The host business must have adequate parking and provide food and beverage for an average of 75-150 attendees. The Chamber staff will use the deposit money to advertise the event to the business community. 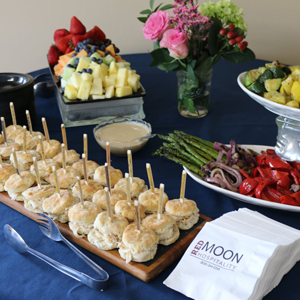 Multiple businesses may partner to host an event, providing the venue meets the host requirements. A full Business After Hours Schedule for 2019 will be announced by the Chamber in early December. A facility that must accommodate at least 75 people and provide ample parking. Sufficient food and beverages must be supplied for guests. Non-alcoholic beverages, beer, and wine are recommended. All suppliers (food, beverage, and decoration) must be Boone Area Chamber of Commerce members. Contact the Chamber for an updated list of catering partners. Table and 2 chairs for registration area. A door prize from your business, or a Chamber member business, to give away as a door prize. Pre-event publicity in Chamber publications and through promoted posts on Chamber social media outlets. Chamber staff to register guests. All business cards from door prize drawing for your use after the event. Apply to host a 2019 Business After Hours by submitting the form below.